Quantum Racing may have won the 2018 52 Super Series championship title, but unsailable light winds on the last day of the 52 Super Series Valencia Sailing Week denied them the chance to pitch for their fourth regatta win of the season. 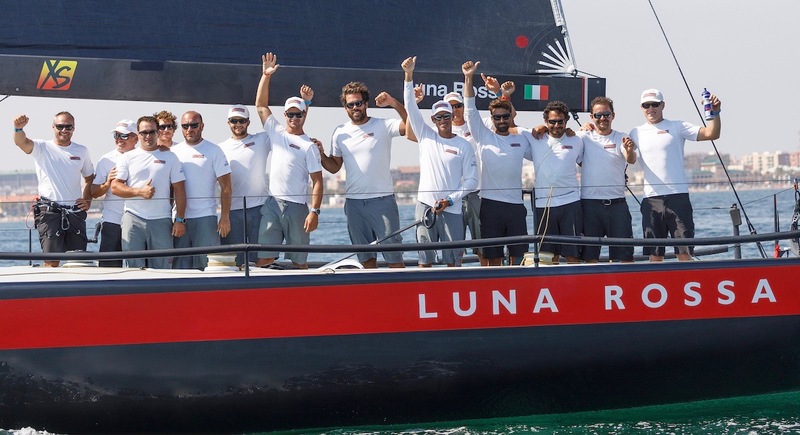 Luna Rossa, the Italian America’s Cup challengers of record, lift the Valencia regatta title, which they add to the Zadar Royal Cup, which they won in Croatia in June. And there was no deciding race to unlock the tie for second place on the 52 Super Series circuit podium for 2018. Harm Müller-Spreer’s Platoon and the Roemmers family’s Azzurra finish on exactly the same points aggregate after the 42 races and five regattas of this season. 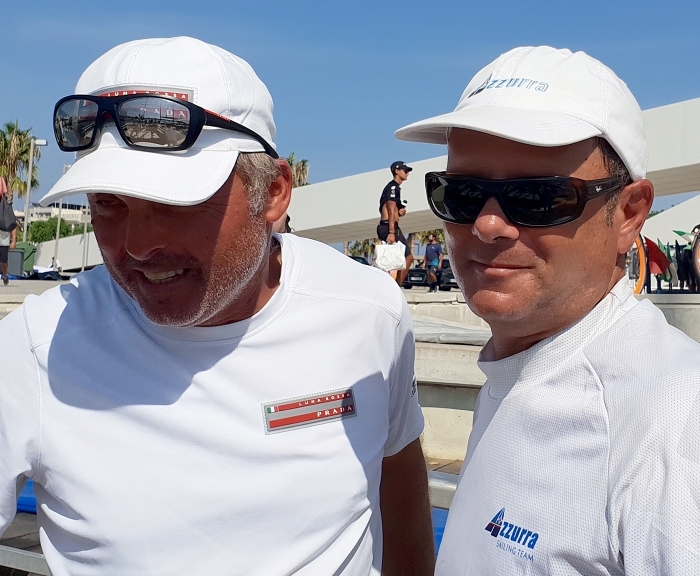 But the German-flagged team, which draws on an afterguard comprising John Kostecki and Jordi Calafat, both winners of successive America’s Cups on these waters, are credited with second on tie break. The deciding factor being which team finishes in front of the other in the last regatta of the season. In truth, the Quantum Racing win – by 37 points – was born one year ago to the day. In Menorca they were bitterly disappointed to finish third after leaving too many points on the water at different regattas. “That hurt. It really did,” recalled Quantum Racing’s unflappable veteran director Ed Reynolds today after the champagne was sprayed at the dock in the Marina de Valencia, which formerly housed the 11 America’s Cup teams of the 32nd America’s Cup. “Dip me in cream and lock me in a room full of kittens. This is the day we have been waiting for, for a year. 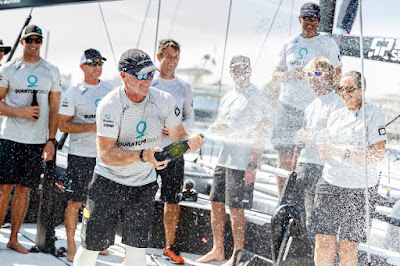 We made it tough on ourselves last season, we sat down and everybody committed to making this season better,” said Terry Hutchinson, Quantum Racing's tactician and skipper. Quantum Racing won in Sibenik and Valencia, and landed the Rolex TP52 World Championship in a windy Cascais with Dean Barker driving, but Hutchinson confirmed his highlight of the season was winning the Puerto Portals regatta with talismanic owner-driver Doug DeVos on the tiller. DeVos could not be in Valencia as planned after the recent passing of his father, Rich. For Luna Rossa, their second regatta title of the season comes after an incredible recovery in what proved to the be final race of the event, yesterday climbing from 11th to second to win the Valencia title by just one point. Underlining again how close the fleet is, Luna Rossa won by just one point from Quantum Racing with Platoon in third, one more point further back. “We are so happy to win here,” Vasco Vascotto, the Luna Rossa tactician said, “I feel like we lost a lot on the last day in Portals, 17 or 18 points on one day. We tried to have the opportunity to fight for the podium and we said to the team ‘let us go to try and win the last event and see what happens. We have done that, but unfortunately the podium is still some points away from us. But I think we are proud to have won two regattas from five. 1. Luna Rossa (ITA) (Patrizio Bertelli) (6,1,1,3,4,6,8,2) 31 p.
4. Azzurra (ARG/ITA) (Alberto Roemmers) (2,3,3,5,7,8,1,9) 38 p.
8. Provezza (TUR) (Ergin Imre) (9,11+ 2 penalti,7,2,9,4,6,4) 54 p.
9. Phoenix (RSA) (Hasso/Tina Plattner) (3,6,9,12RET+2 penalti, 11,2,2,11) 58 p.
3. Azzurra (ARG/ITA) (Alberto and Pablo Roemmers) 197 p.